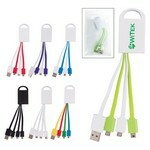 Add your logo to customized phone chargers for gifts or giveaways during your next event. Our promotional cell phone chargers are the perfect way to show your appreciation for employees, to give away at trade shows for prospective customers, or to hand out as prizes are your company picnic. Promotion Pros carries many different options, from customized power banks and wireless chargers to car chargers and emergency phone chargers. 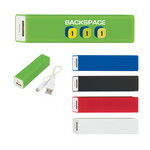 Add your company logo to a phone charger and stay top of mind with your customers! Place your order online today. Our UL Certified State AC/DC Power Anode features foldable convenient plug and comes with customization ability for Brand Recognition with your company logo. Charge multiple devices at the same time using The 3-in-1 Charging Buddy. It includes two micro USB connectors and a mini USB connector. 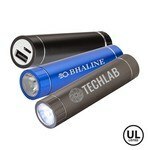 The UL Certified Sprint Digital Power Bank features digital display for battery capacity percentage and creates exciting Business Giveaways with your logo. Our Volta Power Bank features battery capacity/recharging/energy and allows inserting custom imprint for amazing Business Swag. 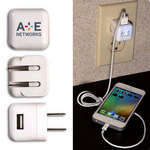 The AC mobile charger is the ideal gift for your customers who are passionate about electronic devices. Plug it into a standard wall outlet and charge your mobile devices through a USB port conveniently. 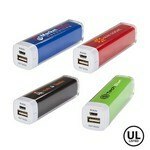 With 2200 mAh battery capacity, the UL Listed power bank is capable of charging most smartphones and tablets. 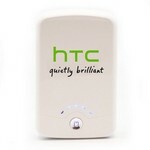 It has Rechargeable Li-ion Battery. The personalized Apt Power Kit with 4400 mAh Power Bank Charger makes it convenient to charge your portable electronic devices. Features 2200 mAh battery capacity, the UL Listed power bank is capable of charging most smartphones and tablets. Includes a micro USB power cord to recharge the lithium battery. The Charge-N-Go Power Bank ensures that your gadgets are functional even when you are on the go. 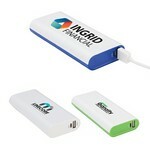 Emblazon your company’s logo on the power bank to help grow your business. 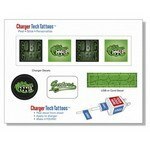 The promotional charger tech tattoos stick and remove easily with no residue.